How does our church work? Every church has an "assimilation plan," which is a fancy way to describe the process of people coming into the church...and hopefully staying. Here is the current one we're working on for Spring of Life Church. 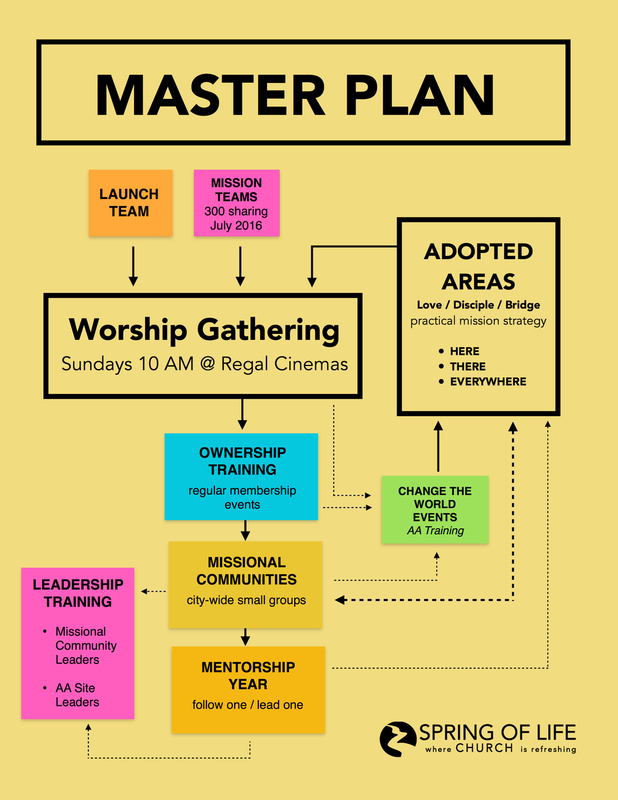 Solid Black Lines: These are the clear “next steps” for people attending our church. Without following these, a person will get stuck in place. Light Dashed Line: these represent individual pathways that people can take, as the Holy Spirit leads. We value the public gathering. This might sound strange to you, but it’s really not. In fact, if you grew up going to church this is the model that you are probably most familiar with. It means that we intend for people to make their first contact with our church in our Sunday morning worship service. We plan on having ours at 10AM at a Regal Cinemas in Downtown Portland. We like this model, but we don’t think it will work well downtown. This is an area where people go out for everything - out for coffee, for dinner, for entertainment. Homes are private, personal enclaves that are rarely shared with others. Because of our culture, we feel like public spaces will be our best chance to connect. We recognize that as our missional communities grow, this may not always be the case. We built a plan for both the growth of the individual and the church body.